Come gather around for Toscano's Taste of Italy event this Wednesday, April 17th from 6pm to 9pm. We will have our reps from Miami Cigars, Marc Thibodeau, and Michael Cappellini, from Toscano Cigars, as they provide information about the Toscano brand. These great fire cured tobacco cigars have a legendary background by being featured in many spaghetti westerns and beloved by celebrities such as Clint Eastwood. If you're looking for a flavorful change of pace this is a great opportunity to learn more about the Toscano brand. We are excited to announce that Apex Cigar Lounge will be offering Black Label Trading Co & BLK WRKs lines! Koy Matta of Black Label Trading Company, will be hosting an event Saturday, February 23rd from 3pm - 7pm at Apex Cigar Lounge. Black Label+BLK WRKs has produced quite the following in recent years with lines such as the Royalty, Boondock Saints, Santa Muerte, & Green Hornet just to name a few. This will be an excellent opportunity to learn more about the Black Label & BLK WRKs lines and get in on some fantastic deals! Come celebrate Apex Cigar Lounge's 1st anniversary with LFD Saturday, October 6th from 3pm - 8pm! Ed Bowles from LFD will be in attendance and will bring a wealth of knowledge about the LFD line-up and the Event Exclusive Unreleased Mystery Blend. Come out and learn more about these cigars and take advantage of the great deals on one of best selling brands in the humidor. We will have plenty of the LFD Double Ligero line-up, Chapter One & Two, the Ligero Cabinet Series, Air Benders, Diggers and many more! Take advantage of the great deals! For every 5 cigars you'll receive the event exclusive Mystery Blend! Mix-and-match 20 cigars receive 15% off and 5 free Mystery Blends! Box of 20 cigars and a box of 5 or 10 cigars for 15% off and 8 free Mystery Blends! 20% off two or more boxes of 20 with 5 free Mystery Blends per 20! Chisel: Medium full - notes of cocoa, coffee, & cinnamon with chisel vitola! Watch for more Anniversary surprises throughout October! Tuesday August 21st starting at 6pm, Carolee Martin of General Cigars will be returning to host Ladies Night at Apex Cigar Lounge. During the event, men are welcome to sit out back on our patio on the farm grounds while the ladies enjoy the Lounge. Carolee has been an avid cigar smoker since 1994 and active in the cigar community since 2008! Come join us at the Lounge while Carolee shares her expertise and experiences in the cigar industry, along with a conversation on all things cigars. Carolee will be more than happy to answer any questions related to cigars. Most importantly, Ladies Night is focused on bringing ladies who enjoy cigars together! Carolee is graciously returning with more gifts and surprises! ACL welcomes Mike Szczepankewicz of Pospiech Cigars Friday, June 8th! We are excited to welcome Mike Szczepankewicz of Pospiech Cigars to the Apex Cigar Lounge on Friday, June 8th starting at 6pm. Mike is owner of Pospiech cigars, a boutique cigar company with a portfolio of cigars, most of which are manufactured at the Nica Suena factory, RoMaCraft Cigars factory. Mike is also co-owner of Cigar Hustler, the renowned cigar shop out of Deltona, Florida. Mike rarely comes out to events as you can see he is very busy maintaining his brands and shop. This a great opportunity to meet a highly experienced cigar industry expert and enjoy some of his great cigars! The Apex Cigar Lounge food crew will be out back on the farm grounds by the garden and barns preparing some great food for customers who head on out and meet Mike and enjoy some cigars. Stay tuned for more updates on specials, deals, and prizes. Apex Cigar Lounge is excited to announce Carolee Martin of General Cigars will be hosting a Ladies Night on Tuesday, May 8th starting at 6pm. During this timeframe men are welcome to sit out back on our patio or on the farm grounds while the ladies enjoy the Lounge. Carolee has been an avid cigar smoker since 1994 and active in the cigar community since 2008! Come join us at the Lounge to listen to Carolee share her expertise and experiences in the cigar industry, along with a conversation on cigar etiquette. Carolee will be more than happy to answer any questions related to cigars. Most importantly, Ladies Night is focused on bringing ladies who enjoy cigars together! General Cigars is one of the largest and most well known cigar manufacturers in the world. The General Cigar portfolio includes some of the best selling brands in the market including; CAO, Macanudo, La Gloria, Partagas, Foundry, and Hoyo brand line-up. 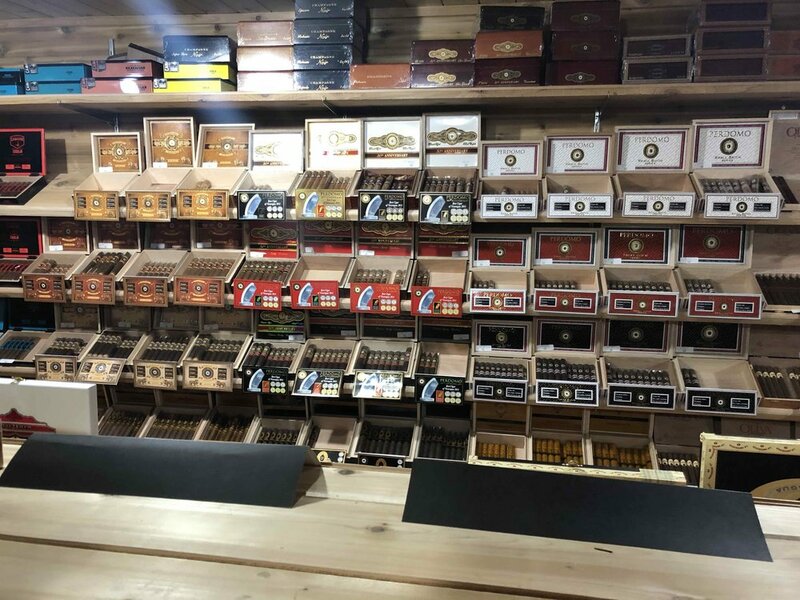 Perdomo Event Saturday, April 14th! We're excited to announce that Perdomo will be hosting an event at Apex Cigar Lounge Saturday, April 14th starting at 3pm. You do not want to miss this fantastic opportunity to take advantage of some great deals on our entire Perdomo cigars line-up. Did you just say you've never had a Perdomo cigar?!?!? Well this is certainly the time to try a few great Perdomo cigars and learn more about their brand as their brand ambassador, Jeff Godfrey, will be in attendance and giving out great swag. The Apex Lounge crew will be hosting a cookout in the backyard to keep all our Perdomo customers well fed. Their brand features some of the best reviewed cigars in our humidor, so come get yours Saturday, April 14th! Many more deals, surprises and raffles! Apex Cigar Lounge is hosting a Pig Pickin' Smokeathon on Saturday, Nov. 11th from 2-6pm. Please come join us and have some smoked pig with sides provided on us! Veterans will receive a special discount at time of check out as a way to thank you for your service. Stay tuned to our Facebook page and events section for more details! You do not want to miss Apex Cigar Lounge's first event on October 14th! We will be having a cookout with some craft beers with Ed Bowles of La Flor Dominicana. It will be a great opportunity to ask questions and learn more about LFD cigars. Ask us about our other boutique cigars that we are carrying and let us give you some of our suggestions. For more details, please check out our events page & we look forward to seeing you there. Apex Cigar Lounge would like your help in supporting the Apex PD in their effort to raise funds for the Special Olympics of North Carolina. On Sept. 30th, Apex PD will ride from the Apex Police Department to Saxpahaw General Store and back. You can register for $30 per bike and $20 per passenger. Kickstands go up at 10:00 AM. There will be lunch and raffle to follow. Copyright © 2017 Apex Cigar Lounge. All Rights Reserved.